do you have a die for this shoe. sizzix, accucut, etc….. I love these witches shoes pattern. I started making them for halloween and friends loved them. I am going to make some for christmas with green and reds. You can purchase it like a normal product and download it to your computer to use as many times as you want! I love your shoe!!!! Can you send me the shoe template. Thank you. Could you please send me the shoe template? Currently working on "The Painted Bra Art Project" Please see our FB page. Wonderful event and fundraiser. 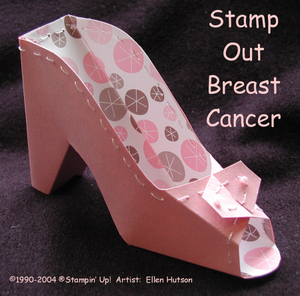 Could you please send me the stamp out breast cancer shoe template. Would make a wonderful table decoration! thanks!!!!! Could you send me the cool shoe template? Really adorable and work making to raise money for a great cause here in NV. Thanks. Very unique style of this blog is the best I've ever seen! ! 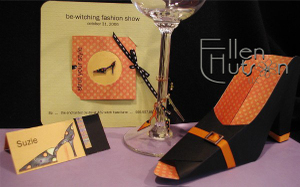 this high heel shoes is made in paper .so great ! Love your site, I would like to invite you to visit my website. It might be interesting for you, I am a fashion illustrator. Very Useful information , this is both good reading for, have quite a few good key point. It's so lucky for me to find your blog! So shocking and great! Just one suggestion: It will be better and easier to follow. I can't wait to make mine... thanks for sharing. Beautiful!!! Hello! My name is Helen, I am from Ukraine. Thank you, very much! I have never seen like this!!! Great! Thanks! I have something in mind for this template, and when I get it done, and blog it, I'll let you know! Thank You for sharing this! You are very talented!